Part 1 of this review is located here. After reading through the first version of this post, some have asked for CPU intensive tasks such as Handbrake. Additionally, the first post didn't measure battery in a perfectly controlled fashion so this time around one of the experiments focused on that. For these tests, I once again prepared the MacBook Air 11" 2012 with raw data sources for stressing the CPU. This included an 8gb raw DVD source files placed on the desktop to leverage the SSD's read speed as well as placing 40gb iPhoto library. 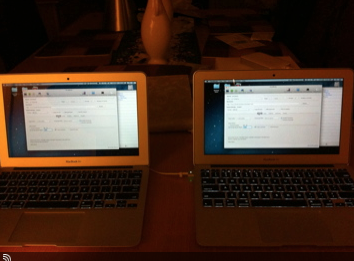 Once the MacBook Air 2012 11" i5 was all setup, I once again cloned it to other MacBook Air 2012 11" i7 in preparation for the tests. The tests include (a) a single cpu iPhoto database rebuild, (b) a multi-cpu Handbrake encoding, (c) a real world battery test lasting three hours of continued use, and (d) a handbrake with the i7 MacBook while in docked under a 27" apple display in the closed clam shape mode. I have a very large 40+ gigabyte library for iPhoto (photos only as I have video's elsewhere) and it was really really sluggish. I initially though it was due to the hard drive not able to keep up with all the media, however after copying the iPhoto library to my MacBookAir i5 I found it shocking it was as slow and sluggish with the infamous spinning colorful beach ball like cursor. Upon discovering how to repair the iPhoto library (something I recommend everyone apply using this blog I additionally wrote ) I started to time the various repair processes simultaneously on both machines. 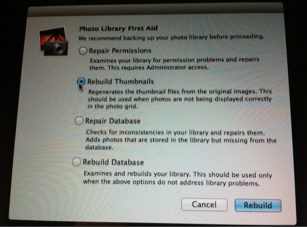 The first repair was rather quick, about 20 seconds or so, and entailed rebuilding the permissions (the first option in the iPhoto repair dialog). In most cases the i7 finished a few seconds quicker than the i5 -- except for one instance where it finished a few seconds later. I was intrigued and investigated further only to discover a running process was running and temporarily taking up about 20% cpu. After a bit of research, I discovered the running process was spotlight indexing parts of the drive. Clearly this process would distort the accuracy of any experiments by a small margin, so I dug further and discovered how to stop spotlight indexing temporarily with a small command line executed through the terminal app. I'm not sure if spotlight is resource intensive to the point one looses 10 or 15% battery, but I may consider having a quick script so I can activate and deactivate it conveniently if it indeed uses valuable battery. With spotlight disabled, the i7 continuously and predictably completed the iPhoto permission repair routing a few seconds ahead of the i5. This test was straight forward. I simply started iPhoto in repair mode (holding Command + Option while launching iPhoto) and started them both while also starting the timer on my iPhone. Again, as I did in the previous blog's tests, I measured CPU temperature, fan speed, overall progress and the final finish times. The repair database process seems to be a single threaded process as only one CPU fired up to max capacity throughout the test as shown in this cpu monitoring tool called Menu Meters. This appeared to be a single cpu process for an extended period. The i7 was able to run at full capacity as the fans never reached maximum operating speed. From the final numbers, it seems the i7 has a very significant speed boost over the i5 with single CPU operations. To perform the hand brake encoding, I updated Handbrake to the latest version and opened the raw DVD source residing on the desktop. By putting the DVD source on the SSD we eliminate the slow IO of an external DVD drive and maximize CPU by feeding it raw DVD as fast As the SSD can provide it. Similarly to avoid I/O bottle necks, hand brake is configured to save the encoded DVD movie on the desktop as well. Unlike the previous test, this used all available cpus and hyper threads available. The i7 did top at 99 degrees 6500rpm fan speed and remained there for the majority of the test. From the final numbers, it seems the i7 has a very significant speed boost over the i5. This is an amazing speed increase and for anyone considering using this machine as a main computer and do not mind the spool up the fans during heavy use, the i7 seems to be the way to go. For the battery test, I charged both MacBooks to 100% and left them plugged in for an additional 30 minutes for any left over trickle charge. I setup a web page which does not cache and auto reloads the USAToday web site every 10 seconds. In addition to this, I launched Windows in a VMWare session configured to use 3gigs (of the total 8gb the machine has) and additionally configure Windows so it does not go to sleep. By leaving windows running like this, the CPU's were gradually above 5-10% of use as shown in the video. This along with the browser refreshing should resemble a typical day of usage. 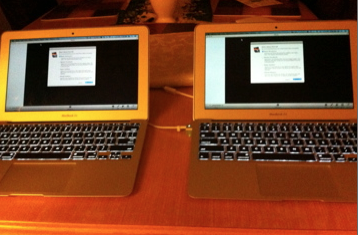 Since I started the test around 3AM, I configured the MacBooks to go to sleep after 3 hours. Upon waking up, I can check the battery meter and compare them among both machines. Normalized over the entire battery, you are looking at a difference of about 12%. Meaning, should the MacBooks stayed on, the i7 would have shut off on it's while the i5 would still have approximately 12% charge left. Since I plan to use my MacBook Air primarily in clamshell mode while at home or office, it's performance in this mode is very important to me. I was VERY surprised with the performance findings in this mode. I did anticipate a higher cpu temperature due to reduced airflow, however I found other surprises too. Unconvinced, I decided to cross check if the i5 also suffers from this. My initial guess is no, because it has better thermal characteristics than the i7. Indeed, that was the case. Below is the same handbrake video being performed by the i5 in clam shell mode. Based on my clam shell mode test, it's clear the CPU never went above 100 degrees and instead the CPU's processing power is reduced to control temperature. In clam shell mode it does indeed not get enough circulation for cooling purposes and instead of the machine overheating or shutting down altogether like the iPad in sunlight, it simply reduces the processing power of the CPU. in this case, it was reduced significantly enough where it was roughly 25% slower than the i5 in open mode sitting on a desk. While the speed increases make the i7 shine when compared to the i5 model, these bursts of speed are most likely not sustainable unless you are in a properly cooled environment and working in the typical open mode. If you plan to use MacBook in clam shell mode, then most definitely the MacBook Air 11" i5 model is way to go for it's superior thermal properties. If on the other hand you have small bursts of power needs, the i7 will give you a good bang for the buck. i did have a question, how do they perform when watching HD video? i use my older core 2 duo air to watch HULU, Youtube or downloaded HD movies on my 55inch tv (in clam shell mode). Do either of these still have that issue. i have been thinking of upgrading, but its not worth it if i still cant watch a fluid video. I think both machines operate nicely when watching video through HTML5. I was watching the keynote presentation (about an hour long) and was able to finish despite having 30 or 40% battery when I started. From what I understand flash video's are not as efficient causing the CPU & fans to spool up and hulu may use flash so I am not sure. Great review! Much thanks! Pleasantly surprised to have my questions answered off of Google. I hope you got the money back for you second MacBook! Fantastic reviews! Truly appreciate your taking the time to do this-- and to do it so systematically--and present the results so clearly. Some major tech site/magazine should hire you to do this for a living! One thing that struck me was the iPhoto Library chart. While the i5 took 8 minutes longer, the temperature never got very high at all, and the fan speed remained at an incredibly low RPM. By contrast, the i7 got much warmer and was hitting the high RPM at which you said it could be quite noticeable. As someone who is sensitive to noise--and wants a cool laptop (akin to the iPad)--that makes me lean toward the i5-- even though the i7 would cost only $90 more. Plus, do we have any idea of whether these comparisons would be apply to the 13" MBA?? That's the laptop I'd want. What a great review dude! It answered all my questions and more. Thank you so much! How much can this be relied upon when considering the 13-inch purchase? I was going to get the i7 but your noise issues with the 11" make me wonder. Surely the 13inch would have better cooling? Darren, the 13 " should have better thermal properties but the i5 in the 13" would be that much more noiseless. Battery life is as lightly improved with the i5. It all depends on what your important needs are. 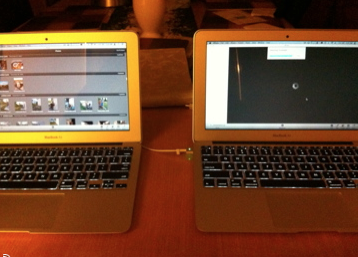 Have you tested the Macbook Air 11" (2012) i5 w/ 8GB Ram for LR4/Aperture 3? Does it suffice or should I get the i7?? Besides the obvious movies and web browsing I plan to be taking around 50 pictures a day with my Canon S100 and do some Lightroom 4 or Aperture 3 retouching on a dozen or so of them. I used to have a 2010 MBA w/ 2GB Ram during my 4 months in Afghanistan and that thing was a pain! Any light editing with Aperture 3 would get me a spinning wheel of death. I definitely don't want that again but also would prefer the i5 with less noise/heating issues if it is able to deal with LR4/Aperture 3 in a proper matter. Thank you for your comments. Vincent, the i5 is sufficiently powerful for all your needs so long as you special order it with 8GB of ram. Keep in mind the i5 from 2012 is as powerful bench mark wise as the MacBook Pro from 2011. Do get the extra memory before anything else and if you can spare a little more then get the extra storage of 256gb next. Thanks a bundle for the help! I was also considering the 256GB at first but since I already have a High end MBP 15" (late 2011) w/16 GB RAM that I use for most things connected to a Thunderbolt display it's not exactly essential for me. Now I love it but it's not really the best travel companion when you go from city to city & island to island in SE Asia. The MBA will only really be used for travel about 2 1/2 months a year so I think 128GB will be enough for my needs. I'd more spend an extra 500 EUR to put a 512GB SSD in the MBP later down the road.